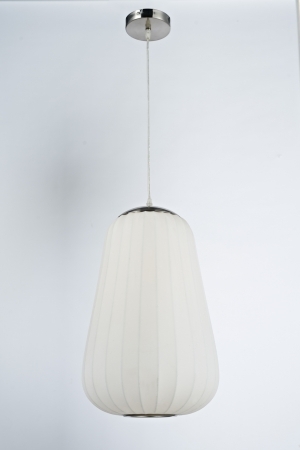 The tear drop like shape of the globe in this pendant light has a contemporary look that makes this the perfect choice for many types of room décor. Aside from the fantastic decorative touch this piece brings to the space, it is also a great way to bring illumination to the area. Shipping: Free Shipping via UPS or FedEx Ground 7 - 10 Business Days; this light fixture will be delivered to your door with no signature required. It is your responsibility to inspect the item thoroughly upon delivery and notify us within 3 business days of any freight damage.